You parked your old little Subaru Dusty two years ago in your backyard, after the engine overheated for no apparent reason. You are in need of some extra money for gift shopping, a birthday party, or just treat your family to an extravagant dinner? We pick up your vehicle for free. You can even suggest your own price to us, we work with you. We offer you a fast payment, on the spot, a bank draft or cash. Here in the desert surrounded land, some people just dump their auto carcass and it is not even nice to look at, we can pick it up the same day you call us, and we do all the paperwork for abandoned cars. We are definitely the very best towing and roadside assistance company in Palmdale, Lancaster, Santa Clarita and the rest of the Antelope Valley! A&D Lancaster Towing provide quality towing and roadside services to Lancaster and various parts of the Antelope Valley. Some people are concerned about the costs of getting their vehicles towed, and we do not blame them — some companies have been known to charge customers with sky-high rates, and on top of that, additional taxes and “hidden” fees that seem to have sprung out of nowhere. You’ll never have to deal with that when you decide to call us. We’re always upfront about our rates, and we’ll break them down to you the moment you call us—we’re always giving rough estimates depending on your location, the type of towing service you need, and the vehicle you have. We have a fleet of cutting edge tow trucks that can handle any of your construction equipment towing needs. Our experienced tow truck operators focus on the fast and safe transportation or your equipment so you can keep your job moving. In the occasion that you are stranded on the side of the road because of an unfortunate flat tire or blow out, there is no reason to panic. Once we have made it to your location, we will change your flat tire for you, then we will examine the rest of your tires to ensure that they are not going to go flat once you are back on the road. We will do all the hard work for you, that includes, taking off your existing damaged tire, examine your spare to ensure that it is in safe. We do not want to put a bad spare tire on your vehicle that could end up going flat once you are back on the road again. If you have experienced any type of car problem, contact the best Lancaster flat tire service that is available. You will be back on the road safely, on your way to your destination quickly, and safely. If you need emergency roadside assistance, call us morning or night, any day of the week and we will dispatch one of our professional technicians to your location. Our goal is to reach each of our customers within twenty minutes of receiving a call to get them back on the road as quickly and as safely as possible. You do not have to be worried about being stranded on the side of the road in a location that you are not familiar with or that could be dangerous. With our professional technicians, we will assess your problem and then we will do whatever is required to get you back on the road or transported to a safe location. Never worry again. Contact our office when you have an emergency and you will be pleased with the service we provide. Now is a difficult time to get into the towing industry as a tow truck operator. 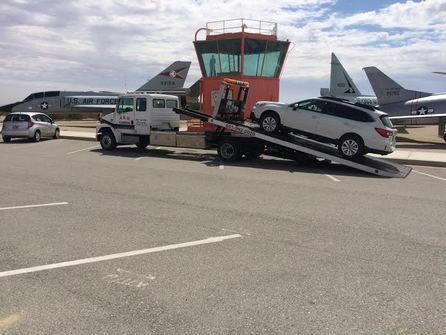 The economy is still in the tank and people are coming up with creative ways to get their lancaster towing broken down vehicle from point A to point B. It is wise to realize that if you are just getting into the tow truck industry, you should have a look at used tow trucks for sale as opposed to new tow trucks for sale. is much higher than for a new Jerr-dan, which can range from $55,000 to $100,000. Both avenues offer benefits and negatives. If you bought into an existing tow truck company, you may already have the finances to look at new rollbacks for sale. If this is the case, then Crawford Truck has an excellent selection of wreckers in Massachusetts available.Another factor that should be considered when you are selecting the right Jerr-Dan for your business is what rig will make your job the easiest due to your location, city or rural area, and size of the area your willing to cater to. Typically in the Northeast, the majority of quality tow truck operators choose Jerr-Dan which have flat beds or they look for rollback trucks for sale. One of the reasons for this is that many vehicles in New England have all wheel drive and you can`t use just any wrecker in Massachusetts to pull an all wheel drive vehicle.Although Jerr-Dan, has recently introduced two new wreckers to the market, that are proving to be very versatile with our client base. The Element by Jerr-Dan offers reliability with street agility. The Element offers "patented over-center LOCKLINK mechanism which locks wheel retaining arms in the full tire-engaged position" and "hydraulic self-loader which offers low profile crossbar with friction- adjustable, self centering feature. "In addition, the MPL and MPL40 Jerr-Dan wreckers offer smart design and relenting performance. This wrecker in Massachusetts offers the longest under lift, over-center LOCK LINK mechanism and a modular aluminum body. One of the most useful features of the MPL is the clear deck top which offers more space for storage- the most usable flat storage lancaster towing in the tow truck industry.The Jerr-Dan MPL40 offers all the great features of the MPL, but also offers some unique optional equipment. In case you liked this article and you would like to be given more information with regards to lancaster towing i implore you to check out our page. One such feature is the Motorcycle towing Adapter which makes one operator loading and unloading of motorcycles a walk in the park. In addition, the MPL40 is also capable of utilizing a Tow Sling which gives the Jerr-Dan additional recovery options for damaged vehicles. The boom feature is also a must for every tow truck fleet. The 8-ton Boom is all hydraulic and offers many additional features to allow for more recoveries in multiple situations.